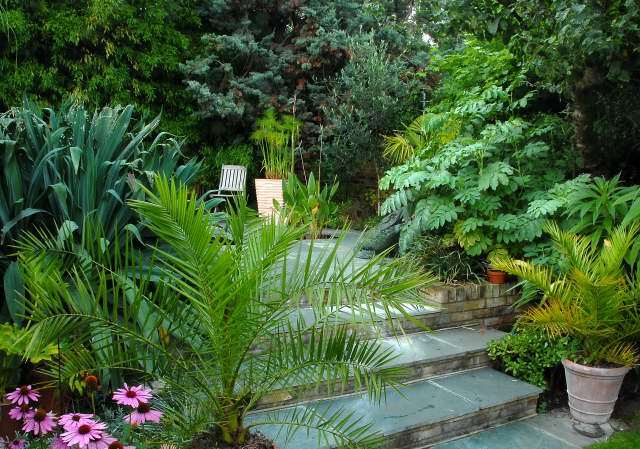 The two small palms either side of the steps are Phoenix canariensis or Canary island date palms. Growing them in pots allows them to be brought close to the house during the coldest months of the year. (There are some reasonably mature Phoenix canariensis planted in the ground and thriving in the local neighbourhood). The yellowing of the leaves on the right hand specimen are due to hunger. Directly behind the right hand pot, next to the step are a group of money trees/jade plants (crassula ovata). As we travel up the steps a Melianthus major . Further along an olive tree (Olea europaea). In front of the olive tree Thalia Dealbata grows out of the formal pond. Just behind is cyperus papyrus, seed grown annually, growing in a large terracotta pot. The right hand corner contains an Arizona cypress (a pre existing plant) which complements the other blue green foliage of the drought tolerant exotics. The screening to the rear is a phyllostachys nigra hedge (black bamboo) . This plant does receive some watering other than rain. The patio is also constructed so that it drains into the bamboo. The spiky blue/green plant to the left is Beschorneria yuccoides. The purple flowers are echinacea purpurea 'magnus'. These are not exactly exotic but they are drought tolerant. Apart from looking pretty their main role in the garden is to attract beneficial insects such as hover flies into the garden.